APRIL 30TH, 2018 UPDATE: Hallelujah, brethren please join me in praising God for Him calling another soul out of sin. Immediately after the children’s fellowship, I decided to visit one of our orphans that our sponsor GMFC / Working Faith Fellowship is supporting. Word had reached me of her being unwell. On the way, I decided to do door to door evangelism. I had an opportunity to preach to some neighbors neat the home she stays. I even prayed for them and one of them repented and gave his life to Jesus. Today, he came to my house and told me he is ready for baptism on Sunday. All glory to our Jesus who is not only our Savior but also our Lord. God bless our sponsors in Jesus name. MAY 6TH, 2018 UPDATE: That brother who received Jesus after house to house evangelism was baptized today. Glory to God and for sure thanks a lot brethren for your prayers and support from over there. You can see the brother looking confused and without hope just one week ago without Jesus. Just one month after his release from jail. Then you will see how God has reformed him. I am seen with him in our fellowship room/church. I personally glorify God for what he has done. I also had given you a short story of this new brother who had accepted Jesus as his Savior and Lord. As I said above, the great news is that he came and was baptized in the name of Jesus today. Amen glory to the Lord Almighty Jesus. 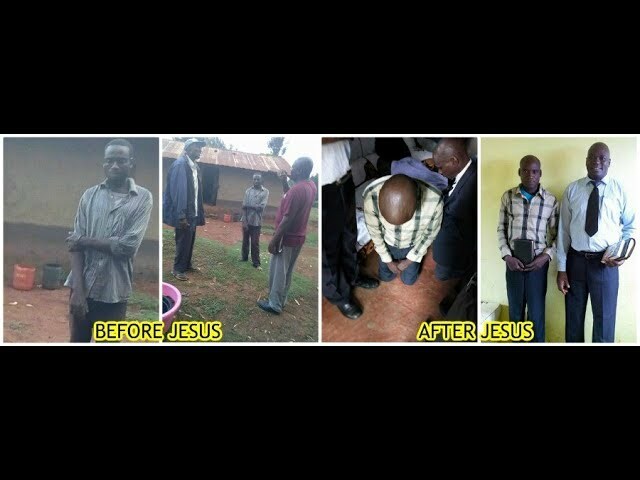 This brother who has been a drug addict and just came from jail has really reformed. Here is own short testimony from his mouth. “My name is Paul Kipchumba. I was a drunkard and a drug addict. All that was surrounding me was sin, alcohol, fornication, drugs etc. I was still doing drugs when one night, I got wasted, got into a fight, and almost bled to death. But I still ended up in jail to serve a three years term for doing drugs. Unfortunately, it got worse before it started getting better. I started seeking spiritual enlightenment in all the wrong places. I involved myself with very many different doctrines and new age stuff (prosperity gospel etc). It was only after a series of events that God humbled me and brought me to a point of brokenness so that I could seek Him. It is in the process of encountering these deceitful spirits that I found the grace of God. He revealed Himself to me in such a way I couldn’t deny. Thank you, Jesus! Also for his servant, brother Haron. I am now saved and I am delivered from all of past life. All my addictions have stopped and gone forever and my prayer is God to give me the wisdom to see and walk the truth amidst all this modern mess. In my walk with God, I desire to know Him more. I have been taken through a lot of scripture by brother Haron and God has taught me a lot. Having now received the correct teaching of the Bible, I want to influence my fellow friends and just explain to them about Jesus, what He has done for me. It is my desire to help others in finding the grace of God. I want to reach my former drug addicts and mostly be able to pass the pure gospel of Christ to them “. [End of testimony. Amen!] God bless this brother in Jesus name. To all our sponsors and supporters, may God bless you mightily, for through your support, such brothers are rescued from the grip of the devil. I am sure God is saying “well done good and faithful servants”. This is such a blessing and a great way to get more lost souls to God and share the gospel with our friends, relatives, and even strangers. I pray for your continued support. God bless you. Bro Haron Wanjala. INCREDIBLE VIDEO OF PAUL – FROM “OLD” TO “NEW”!